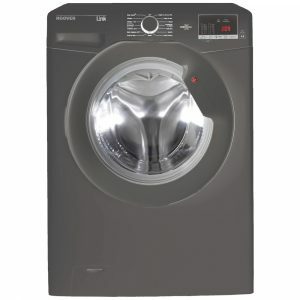 This graphite Hoover condenser dryer has an impressive 10kg capacity and is B rated for energy efficiency. This unit can be placed anywhere in your home as it has a condensing unit which eliminates the need for a vent hose. The machine converts the steam back to water and you simply empty the water container when required. This Hoover freestanding washing machine has an impressive 8kg capacity and a 1600rpm spin speed. It is finished in graphite and carries a one year parts and labour warranty. 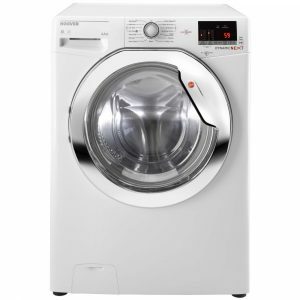 With an A+++ energy rating it is a highly energy efficient washing machine. This white Hoover heat pump condenser dryer has an impressive 11kg capacity and is A++ rated for energy efficiency. This unit can be placed anywhere in your home as it has a condensing unit which eliminates the need for a vent hose. The machine converts the steam back to water and you simply empty the water container when required. This brilliant 9kg 1600rpm AXI washing machine from Hoover, featuring innovative Artificial Intelligence technology, takes washing your clothes to a whole other dimension. AXI can understand your voice, your laundry habits and provide bespoke washing solutions personalised for your family and your life. 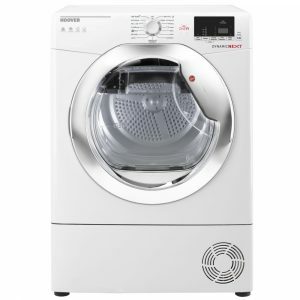 It has fantastic features such as Total Care, giving you the freedom to wash all kinds of fibres and colours together with outstanding results, and Care Dose which is an intelligent self-dosing device that releases the perfect amount of detergent to the milligram, according to the programme and the loading quantity. You can get up to 21 cycles with maximum comfort and efficiency. This model is fully Wi-Fi connected with a host of bespoke functions, you can control AXI via Hoovers Wizard App, Amazon Alexa or Google Assistant! 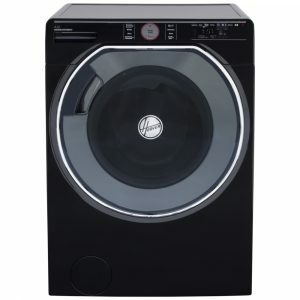 Also, boasting smooth touch controls, an A+++ energy rating, and finished in graphite, this washing machine is the ideal addition to any home! This Hoover freestanding washing machine has an impressive 9kg capacity and a 1400rpm spin speed. It is finished in white and carries a one year parts and labour warranty. 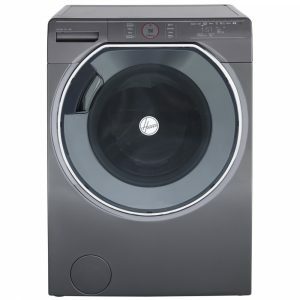 With an A+++ energy rating it is a highly energy efficient washing machine. 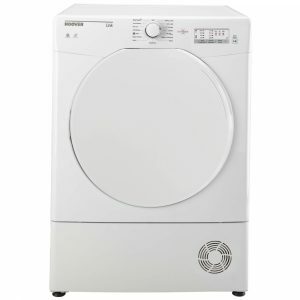 This white Hoover tumble dryer has an impressive 8kg capacity and is B rated for energy efficiency. This unit can be placed anywhere in your home as it has a condensing unit which eliminates the need for a vent hose. The machine converts the steam back to water and you simply empty the water container when required. This fantastic 10kg 1600rpm AXI washing machine from Hoover, featuring innovative Artificial Intelligence technology, takes washing your clothes to a whole other dimension. AXI can understand your voice, your laundry habits and provide bespoke washing solutions personalised for your family and your life. 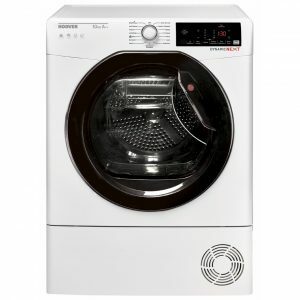 It has fantastic features such as Total Care, giving you the freedom to wash all kinds of fibres and colours together with outstanding results, and Care Dose which is an intelligent self-dosing device that releases the perfect amount of detergent to the milligram, according to the programme and the loading quantity. You can get up to 21 cycles with maximum comfort and efficiency, and Weather Forecast tells you the best time to start your wash. This model is fully Wi-Fi connected with a host of bespoke functions, you can control AXI via Hoovers Wizard App, Amazon Alexa or Google Assistant! Also, boasting smooth touch controls, an A+++ energy rating, and finished in black, this washing machine is a must have appliance! This Hoover washing machine has an impressive 10kg capacity and a 1500rpm spin speed. It's finished in white with a chrome door. 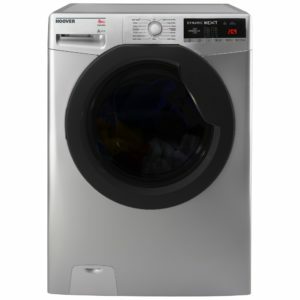 With an A+++ energy rating it is a highly energy efficient washing machine. The 3D Dynamic Wash System uses increased water pressure, curved paddles and a raised dome system to move the laundry in a 3-dimensional way, providing the innovative dynamics that ensures clothes are washed to the optimum performance. The new way to wash from Hoover. 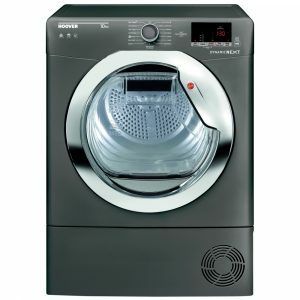 This superb Hoover washer dryer has an impressive 8kg wash load and a 5kg drying capacity. 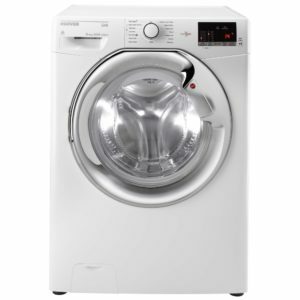 With a 1600rpm spin speed and an A energy rating you can be assured of its efficiency. It is finished in white and comes with a one year parts and labour warranty. This Hoover washing machine has an impressive 8kg capacity and a 1500rpm spin speed. It is finished in graphite and has an A+++ energy rating. 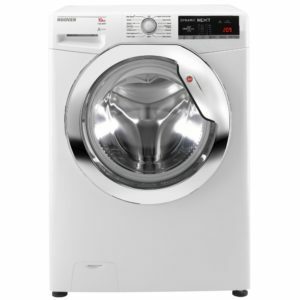 Bosch’s impressive range of laundry appliances can be found above. If these aren’t doing it for you, then please head over to our Bosch section to shop from our entire range of their outstanding appliances. 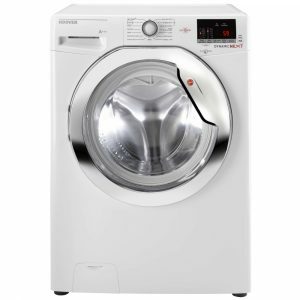 If you want to shop around, head to our laundry section, where you can browse our washing machines, tumble dryers and washer dryers from a host of market-leading brands.